We’ve experienced some dramatic heat waves this summer. Temperature records continue to be broken, particularly in the far West. And heat is not just uncomfortable, it can actually affect your health. That’s why it’s time for Western gardeners to start taking the subject of shade seriously. The Southern and Eastern coasts have their hurricanes and floods; the Midwest it’s tornadoes (and floods). In the West we have our droughts, wildfires – and heat. Each region experiences extreme weather that can make life miserable, destroy property and yes, kill. So, we need to prepare for extreme weather. And the situation isn’t likely to get any better. In fact, we can expect to experience weather extremes more often in the future. We are already seeing these effects of climate change in every part of the globe, including California. 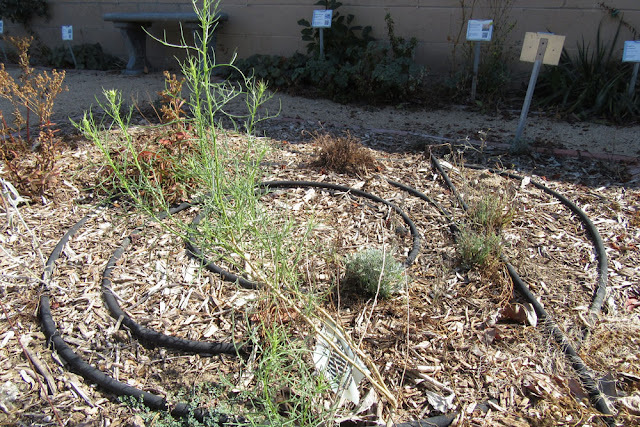 That’s why planning for extreme heat is important for gardeners throughout the West. And the time to plan – and act – is NOW. California’s natural areas can teach us valuable lessons about surviving heat. 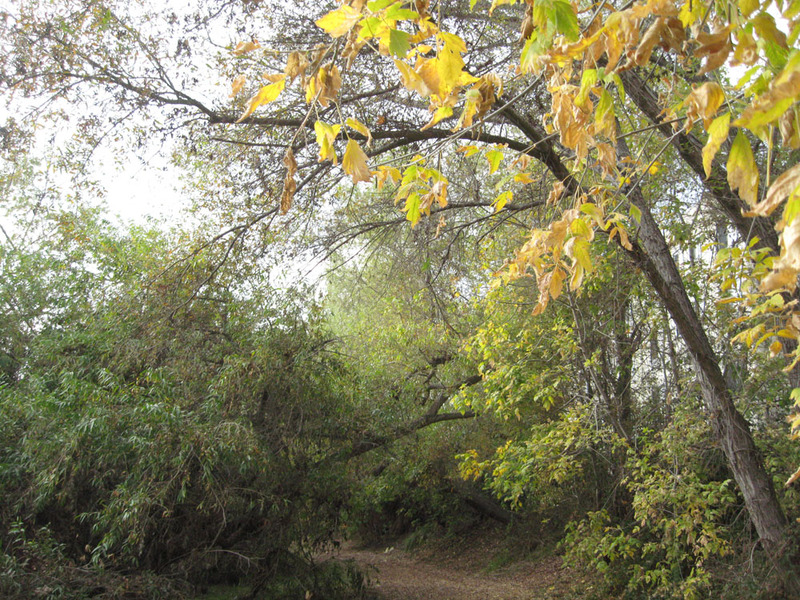 Visit a nature preserve or forest on a hot, dry day to directly experience the dramatic difference between sunny areas and nearby shade under trees. The temperature difference can be as great as 10-15 degrees Fahrenheit (5.5 to 8.3 degrees C.) between the two. 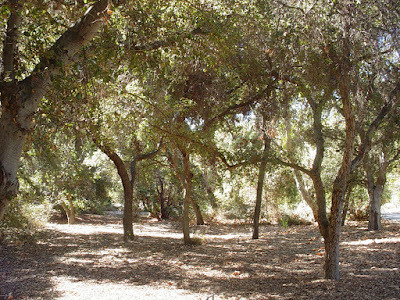 The shade beneath trees is often at least 5 degrees cooler than even the shade produced by man-made structures (porches; canopies). Why is it cooler in the shade beneath trees? There are several processes at work. First, the leaves in the tree canopy capture (and use) some of the energy arriving from the sun. Less of the energy is released as heat; and the heat is released from many leaves, some of which are high above the ground. So less heat reaches the ground. 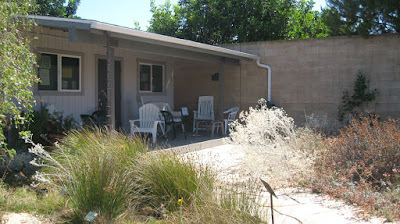 A porch provides shady seating. In contrast, most man-made structures reflect some of the energy (particularly if coated with a reflective coating), but mostly absorb it and release it as heat. You can often feel the heat radiating from a roof or wall on a hot day. So a shady back porch, while cooler than in the sun, is less efficient at releasing heat than is a tree. A second, and more important reason involves a process known as evaporative cooling. On a hot day, plants release water (water vapor) into the surrounding air. This increases the humidity around the plant, cooling the surrounding air on hot, dry days. Think of plants as Mother Nature’s mist machines – it’s the same principle. Evaporative cooling is the main reason why you feel cool when sitting under a tree on a hot day. Of course evaporative cooling works best when the air is dry. On hot humid days, the effects (alas) are less. 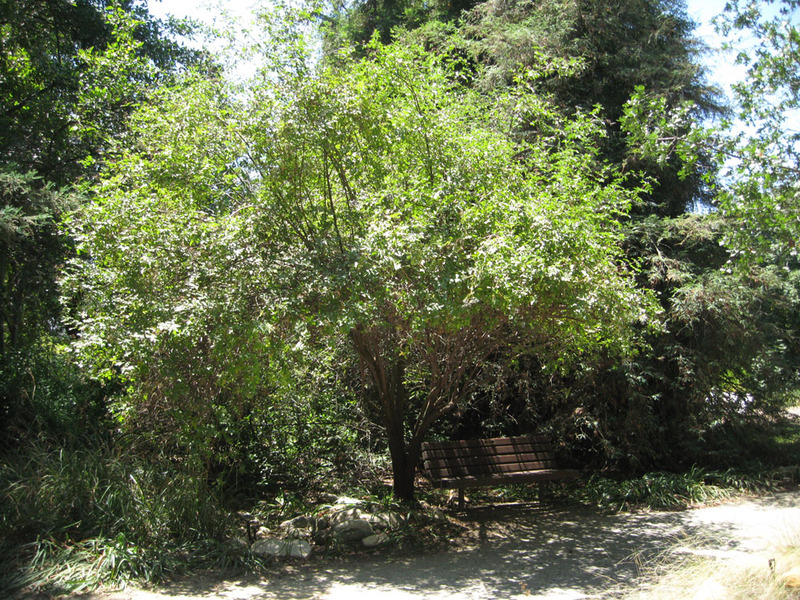 Established trees provide maximum shade and cool. The wisdom of shade trees was well known in past generations. Native inhabitants took advantage of shady groves and forests during the hot months of summer and fall. 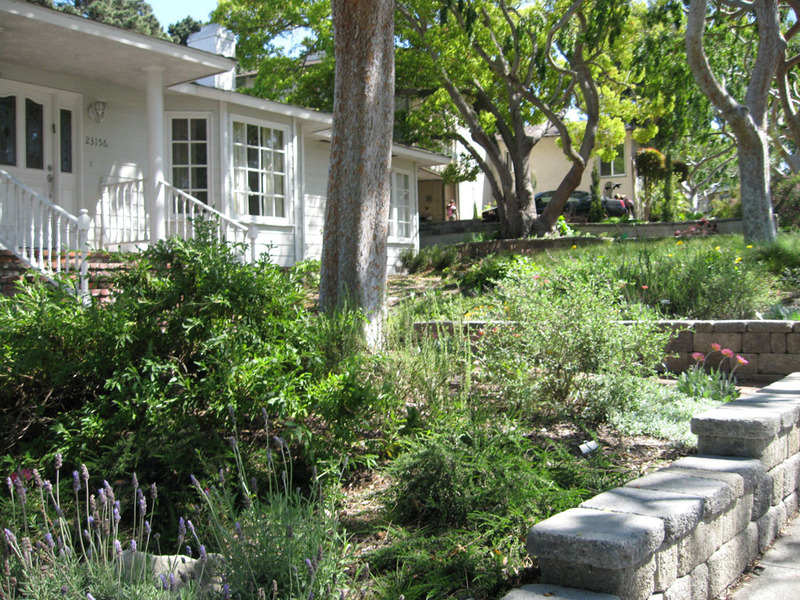 Early settlers and suburban ‘settlers’ planted shade trees among their first improvements. Before the era of air conditioning, all Westerners knew the value of a good shade tree. But in some neighborhoods, that wisdom seems to have been lost. Blue elderberry provide shady seating. Choose a tree that gives you something to eat: a citrus tree, another garden fruit tree or a Blue elderberry or native cherry. Or choose a tree/large shrub with other characteristics you like. A tree can provide food, habitat and beauty in addition to shade. Make the most of your space by choosing wisely. Plant the tree next winter, when the ground is moist and a tree has the best chance of getting off to a good start. Plant it where it will shade your house or provide shady outdoor seating; in our hemisphere, shade is to the north and east of trees. Give your tree some extra water the first 3-4 years after planting. It needs to grow and establish a good root system. 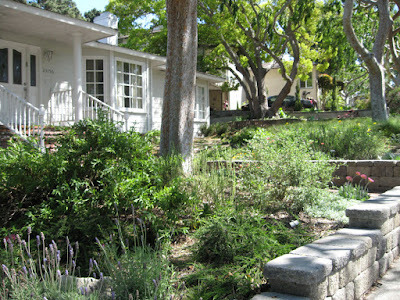 Shade trees help cool a local home. 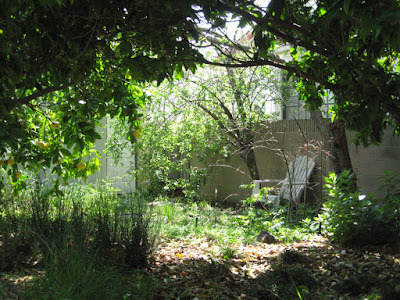 And then, in 4-5 years or perhaps a little more, you will experience the joys of shade in your own yard. You’ll be thankful when you sit outside – or when the electricity goes out during a heat wave. You have planned ahead for the inevitable – more hot days, in pretty much every month of the year, in S. California. It’s early fall and - fortunately for the pollinators - some of the fall-blooming sunflowers are still in full glory. We’ve already featured several of them. But one of the more unusual garden species, the Shrubby butterweed, can still be viewed in our Garden of Health. The scientific name is pronounced sen-EE-see-oh FLASS-i-dus DUG-las-ee-eye. This plant goes by many common names including Douglas’ groundsel, Threadleaf senecio, Threadleaf groundsel, Creek groundsel, Threadleaf ragwort, Douglas’ ragwort, Douglas' shrubby ragwort and Bush senecio. The Senecios, commonly called Ragworts or Groundsels are a mixed bag of plants in the Sunflower family (Asteraceae). 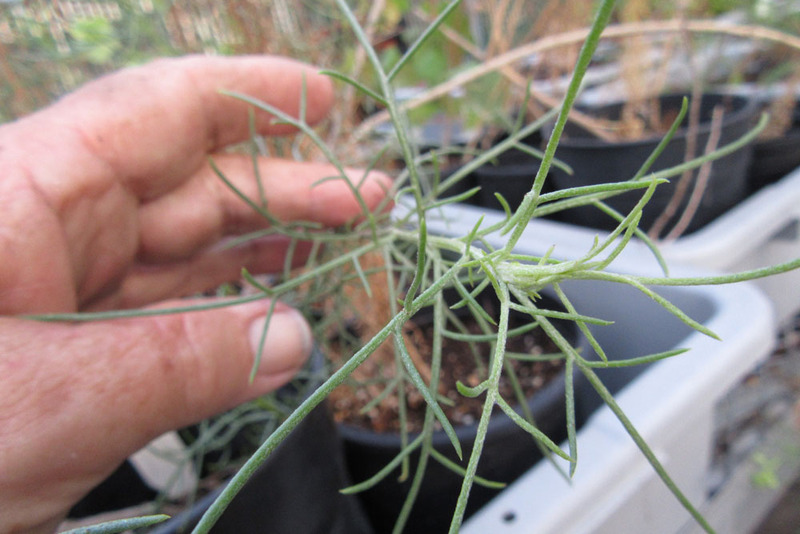 The genus Senecio is currently under revision, based on increasing DNA evidence. It currently contains over a thousand species worldwide. Some are succulent; others are drought tolerant, but not succulent. Some produce chemicals that are toxic and/or medicinal. And all have yellow ‘sunflower’ type flowers. 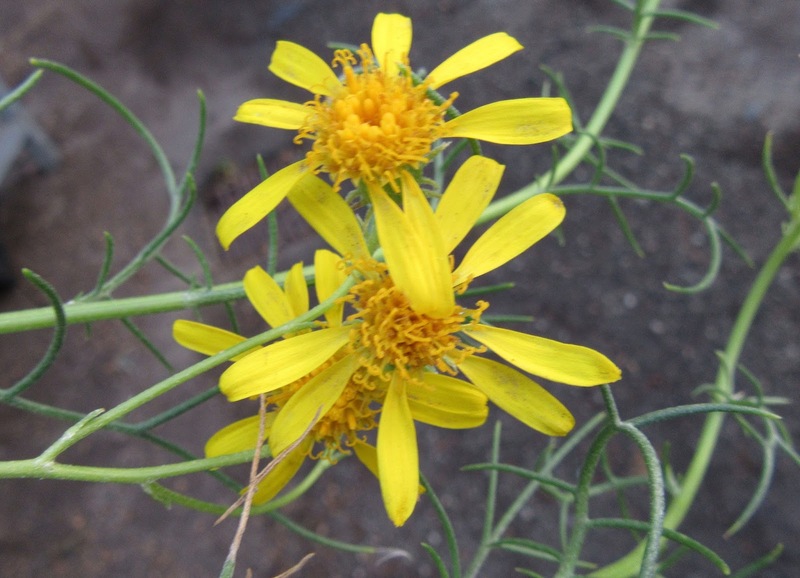 In California, there are currently 19 native Senecio species, as well as a number of non-native, invasive species. Of the natives, the vast majority grow in the Sierra Nevada Range. But six species are native to Los Angeles County, with three native to western Los Angeles County. Of the local species, California butterweed (Senecio californica), Island senecio (S. lyonii) and especially Senecio flaccidus are the most common. In fact, Senecio flaccidus has an interestingly wide geographic range. The species is native to Southwestern U.S. and Northwestern Mexico, including Baja California. It currently has three named varieties. Senecio flaccidus var. flaccidus is native to the Southwest, including the Four Corners states, TX, OK and KS. Variety monoensis is native to the drier mountains and desert washes of Southern and Central California, including the north side of the San Gabriels. 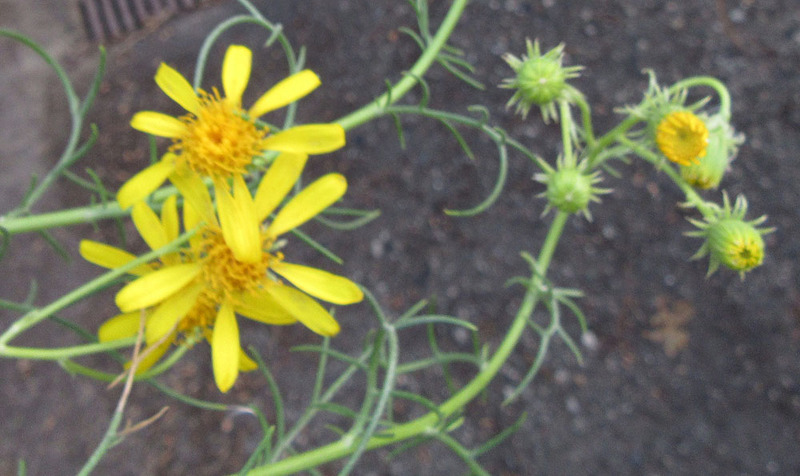 And Senecio flaccidus var. douglasii (sometimes still known as Senecio douglasii), which is widespread from the Northern California coast and western Sierra foothills to the Los Angeles basin and foothills. The southern extent of its range is Northern Baja CA, Mexico. In S. California, Senecio flaccidus var. douglasii usually grows along creeks and in seasonal stream beds in Foothill Woodland, Coastal Sage Scrub, Chaparral, Valley Grassland, Creosote Bush Scrub and Pinyon-Juniper Woodland plant communities. The soil is well-drained and often rocky. Plants often get some summer moisture in the wilds. Shrubby butterweed is a short-lived (4-6 years) part-woody sub-shrub that loses its leaves after blooming (or when drought stressed). It rarely grows to more than about 2-4 ft. (less than 1.5 m.) tall and wide. It creates additional branches each year, ultimately, becoming a mounded, rather open, shrub. 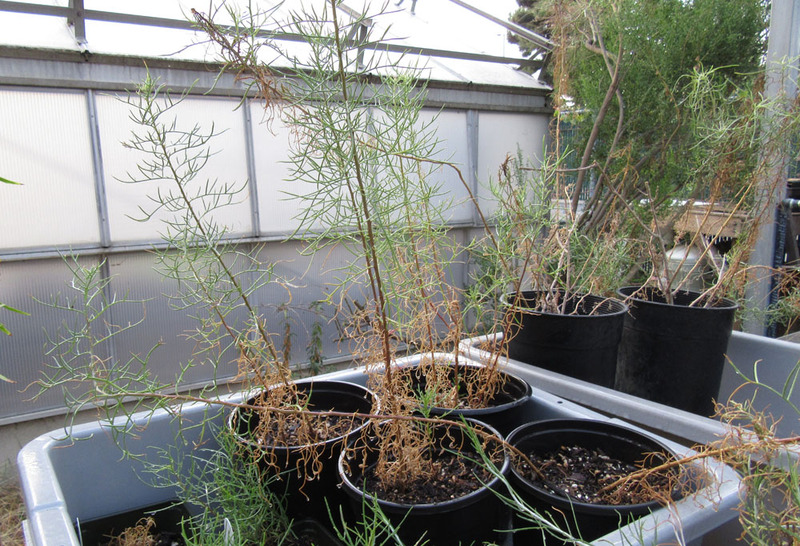 Our plants, raised from seed, are young and have only a few branches (photo above). For a better idea of mature plants, see references 2 and 3, below. Senecio flaccidus var. douglasii has blue-green to medium green foliage. The color becomes almost gray in full sun in hot locations. The branches are slender and wand-like. 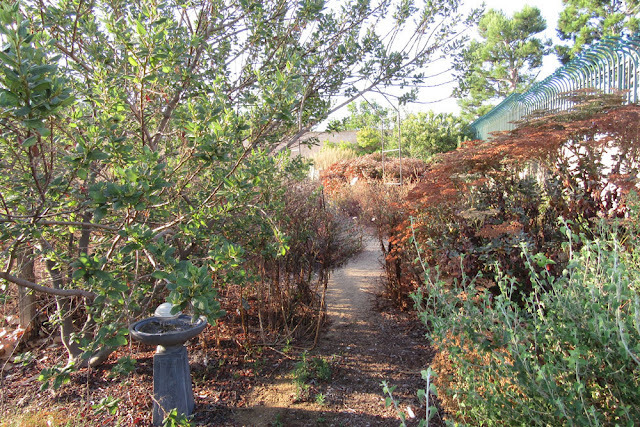 The leaves are deeply divided into narrow, linear lobes, so the foliage is very open, giving plants a lacey appearance. This is the most open of the native bush sunflowers we grow. The foliage has little to no aroma. Ranchers dislike this plant because the foliage is toxic, particularly for cows and horses. 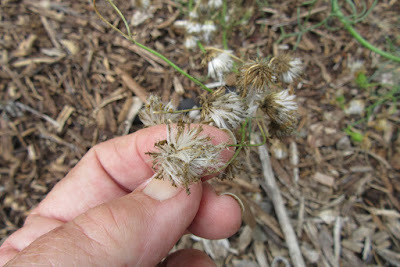 The foliage and seeds are also toxic for humans and pets if eaten – a consideration for planting this species. Shrubby butterweed is a summer/fall bloomer. It can bloom off and on, with available water, from June through October (or even all year long). We tend to think of it as a September-October bloomer in our gardens. The flowers are a bright golden yellow, arranged in typical sunflower heads. Both the ray and the disk flowers are yellow in this species. Like many Senecios, the number of ray flowers is relatively few (8-14) and there is usually space between them (see below). The flowers are showy and cheery – a welcome sight among the oranges and browns of the fall buckwheats. The flowers attract a wide range of insects including butterflies, native bees and other pollinators. We’ve also seen Praying mantis and other carnivorous insects on this plant. 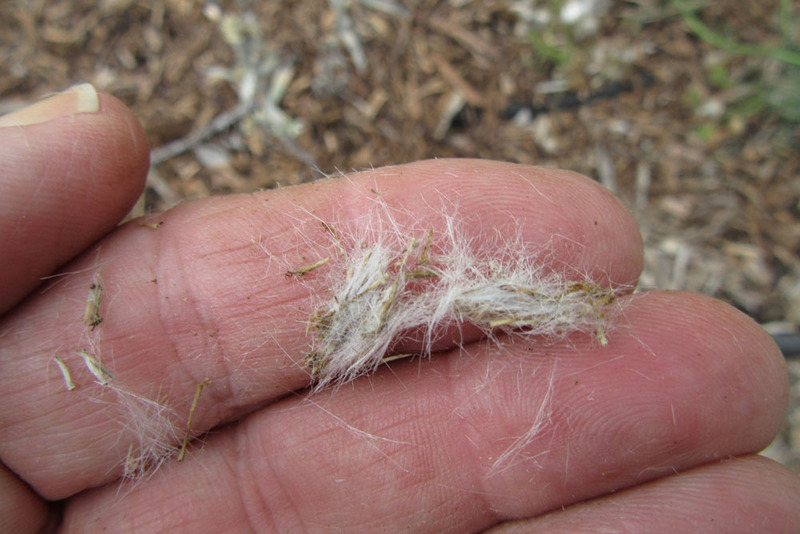 The seeds are small and dry, with a fluffy tail. Seed eating birds, most notably the finches, eat them in the fall. Senecio flaccidus var. douglasii grows in full sun or afternoon shade. It commonly grows in well-drained soils (sandy or rocky) but ours is doing fine in clay. This is a very drought tolerant plant, but we like to give it occasional water, particularly in August and early September, mimicking the summer monsoons. We suspect it would do fine with more water than we give it – and likely flower over a longer season. This plant is tough, but it needs a little water in summer, at least in the dry areas of western L.A. County. 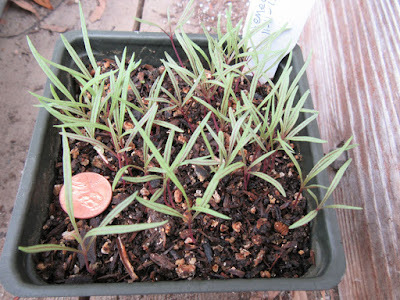 And it’s easy to grow from seed (see below). Plant fresh seed in fall/early winter, keep well-watered – that’s all there is to it. This species was occasionally used as a medicinal plant. It is most safely used externally, as a poultice for achy muscles or for pimples, boils and skin infections. Do not take this plant internally, and use externally only occasionally. All parts of the plant can be toxic to the liver, particularly with prolonged use. For more on the medical precautions associated with this plant see references 4 and 5, below. Shrubby butterweed is little used in conventional gardens, even the water-wise ones. The toxicity of the foliage is an issue; and there are alternative, more benign native sunflowers available. But the Senecios have a certain look – somewhat like a golden Coreopsis – that is just what’s needed in some fall gardens. The flowers make great cut flowers and can also be used to make a yellow dye (wash hands after handling). In short, we like this native Senecio.